During WW1, when the number of wounded soldiers outnumbered the available beds in the military hospitals, many Stately Homes opened some of their rooms for convalescing officers. One of these was Wilton House, near Salisbury, Wiltshire. The large and small smoking rooms were the probable site of the main wards although the smaller rooms on the south side may also have been used. It may have opened in May 1915 with a dozen beds but this increased as the need grew until, in 1918, there was an average of 58 beds available. It was staffed by 4 registered nurses, (Sister Mabel Myring was in charge for part of the time), and at least 10 VADs. Voluntary Aid Division was a combination of British Red Cross and St John’s Ambulance men and women recruited mainly from local sources. There were some RMC orderlies and the whole was administered from Larkhill Military Camp with Dr Ord as the M.O. The VADs did basic nursing care but also helped in the kitchen under the supervision of the permanent cook. The average length of stay is recorded as being 40 days. There were some deaths as noted by David, the second son of the Earl and Countess. When he, at the age of about five, asked where they had gone was told “they have gone home” but at least one is buried in Wilton Cemetery. 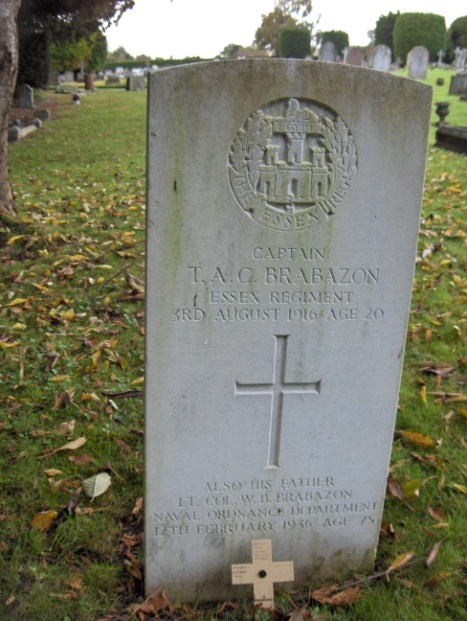 Capt Terence Anthony C. Brabazon, of the Essex Regt who came from Rochester. In May 1915 he was wounded in the arm, recovered and returned to France where he was wounded again in June 1916. He came to Wilton but died of “septic pneumonia” in August at the age of 20. His father, LtCol William Brabazon was director of Ordinance at Portsea. When he died in 1939 he chose to be buried with his son in Wilton Cemetery. This story was donated by Margaret McKenzie of Fovant History Interest Group from sources including the British Red Cross Records, A History of the British Red Cross in Wilton by M. Davis and Second Son by David Herbert.